A 2016 BCCB Blue Ribbon Award Winner and 2016 Booklist Editors' Choice! Welcome to the Super Happy Magic Forest, a super happy, super magical place filled with picnics, dancing, and fun. That is until the source of all things joyous, the Mystical Crystals of Life, are stolen! Five heroes -- a fairy, a unicorn, a faun, a gnome, and a talking mushroom -- have been summoned by wise Old Oak to retrieve the Crystals, but the epic quest won't be easy. They must first battle through frozen lands, navigate past scary dungeons, and encounter terrifying creatures along the way. Will these heroes save the day? It's hard to say! 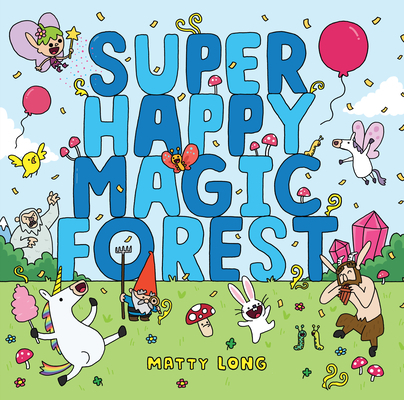 With so much to laugh at and explore, lovers of silliness, adventure, and all things magical won't be able to get enough of Super Happy Magic Forest! Matty Long recently earned a master's degree in children's book illustration from the Cambridge School of Art in England.